Dozens of elephants and rafts have been deployed to rescue nearly 500 people trapped by floods in a popular resort in southern Nepal, officials say. Several hotels in Sauraha, in Chitwan district, have been inundated, trapping the tourists, many of them foreigners. 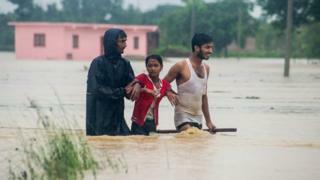 The floods and landslides caused by torrential rains have killed at least 49 people across the country. The Red Cross says 100,000 people have been affected, with communications and electricity cut off in many areas. Pictures showed collapsed bridges and roads submerged or covered by debris from landslides, hampering the rescue efforts. Thousands of residents had been forced out of their houses in the hardest-hit areas, officials said, warning that the death toll could rise as at least 17 people were still missing. A hotel owner in Sauraha, 155km (96 miles) south-west of the capital, Kathmandu, said the elephants had been used to take the tourists to the nearest open road and airport. Narayan Prasad Bhatta, the chief district officer of Chitwan district, said: "We are mobilising all the resources we have to ensure that everyone is safe." Prime Minister Sher Bahadur Deuba expressed his condolences and urged people to remain calm. "I have already instructed authorities concerned to rescue flood victims, move them to safer locations and immediately provide relief to them," he said. The monsoon season, which starts in June and ends in September, causes big floods in Nepal each year. Officials say more rain is expected in the next few days. Meanwhile, in neighbouring India, 45 people were killed when a massive landslide swept two packed passenger buses off a hillside into a deep gorge. Officials in the northern Himachal Pradesh state said the buses had stopped for a break when the landslide, also caused by heavy rains, hit.